NORTH JUDSON, IN. 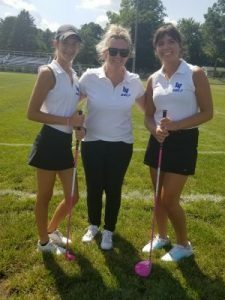 – The annual Hoosier North Athletic Conference Girls Golf Championships will be held Saturday, September 8, at Chesapeake Run, North Judson, IN. The event is scheduled for a 9 a.m. eastern tee time. USGA Rules will govern all play with the exception of local course rules. Summer/Winter Rules to be decided on the day of the meet. In case of a tie for medalist, additional hole/holes shall be played until the tie is broken. If there is a tie for first place in the team scores, the 5 th score applies (will count). Ties For Top 2-7 Individuals will be broken starting with the lowest handicap hole.